Now that a dramatic new test has confirmed that a piece of thermal insulation flaking off of space shuttle Columbia's external tank during launch was the most likely cause of its destruction during reentry, the typical second-guessing in the press has focused on NASA engineers, asking: "What did Mission Control know, and when did they know it?" Somehow, NASA engineers should have guessed about the damage done to Columbia's thermal tiles and pulled an Apollo 13-style rabbit out of their hat. The implication is that they should have been omniscient and omnipotent. Having heroes like NASA's mission controllers around to quietly brave the world's criticism certainly serves to divert attention from those who have done the most to contribute to this disaster -- and who regard themselves as omniscient and omnipotent enough to command the entire American economy and the lives of its citizens: the environmentalists. Why did the shuttle's foam insulation flake off? In response to an edict from the EPA, NASA was required to change the design of the thermal insulating foam on the shuttle's external tank. They stopped using Freon, or CFC-11, in order to comply with the 1987 Montreal Protocol, an agreement designed to head off doubtful prognostications of an environmental disaster. But it was the elimination of the old foam that led to a real disaster for the shuttle program. The maiden flight with the new foam, in 1997, resulted in a ten-fold increase to foam-induced tile damage. The new foam was far more dangerous than the old foam. But NASA -- a government organization afraid of antagonizing powerful political interests -- did not reject the EPA's demands and thoroughly reverse their fatal decision. Instead, they sought a compromise, applying for a waiver from the EPA that allowed them to use the old foam on some parts of the external tank. NASA notes that it is impossible to ascertain with certainty whether it was the old or the new foam that caused the recent disaster, and environmentalists will no doubt say this means that we can't pin the disaster on them. But any unnecessary increase in risk in an enterprise so unforgiving of error, is unacceptable. The bottom line is that NASA took a much greater risk in order to comply with EPA demands. Environmentalist junk science trumped sound engineering. This is not the first time that has happened. 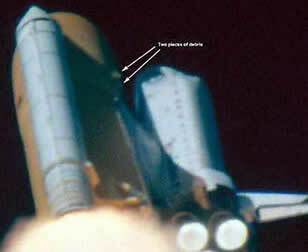 The cause of the 1986 Challenger explosion is officially established as hot gases burning through an O-ring joint in one of the solid-rocket boosters. NASA was roundly criticized for its decision to launch in cold weather over the objection of some engineers, but there was a deeper cause that was not as widely reported. In 1985 NASA had switched to a new putty to seal the O-ring joints. The new putty became brittle at cold temperatures, thus allowing Dr. Richard Feynman to teach NASA a famous lesson. At the congressional hearing investigating the accident, he simply placed some of the O-ring putty in a glass of ice water and crumbled it in his fingers. NASA had changed the sealant because its original supplier for O-ring putty stopped producing it for fear of anti-asbestos lawsuits. Had NASA not run out of the original putty, the Challenger disaster would not have happened. Indeed, when the Air Force ran out of the same putty and replaced it with the same brittle substitute, their Titan 34D heavy-lift boosters suffered two sudden launch failures, after a string of successes that had lasted as long as that of the space shuttle. These accidents are not primarily the fault of careless engineers, nor are they merely the unintended consequences of bureaucrats blindly following federal rules. They are the result of a philosophy that hold human needs -- such as the need for a safe shuttle launch or re-entry -- as less important than a concern to preserve the purity of nature from the products of industrial civilization, such as CFCs and asbestos insulation. Had 2000 presidential candidate Al Gore had his way, Columbia's last mission would have carried a spacecraft called Triana into space. Triana was meant to beam continuous images, via the Internet, of a very small Earth as seen from a point between the Earth and the Sun. The idea was to convey the message of how small and fragile the Earth is, and consequently how small man is, compared to the vastness of space. That's the theory: man is small and should sacrifice for vast nature. The practice? Fourteen dead astronauts.